How international of a city is Miami? Miami is the top-ranked large metro area by percentage of foreign-born population, with over 40 percent of residents from abroad (triple than national average). New arrivals from overseas continue to flock here, with Miami ranked second for new residents from abroad in 2015 (1.9 percent of the population having arrived in the previous year alone). Miami ranks second among large U.S. metros for foreign-born residents with a bachelor’s degree or above (41.4 percent) or advanced degree (39.4 percent). Miami also ranks second among large U.S. metros for foreign-born share of its high-skilled creative class (38.9 percent). Miami ranks ahead of New York, Los Angeles, and San Francisco on all three metrics, with only San Jose ranked higher. Miami is the seventh ranked U.S. metros for exports, with $33.3 billion in goods and services exported in 2015. Miami was the top ranked metro for international freight in 2016, which includes the amount of merchandise goods, commodities, and cargo that transported internationally. 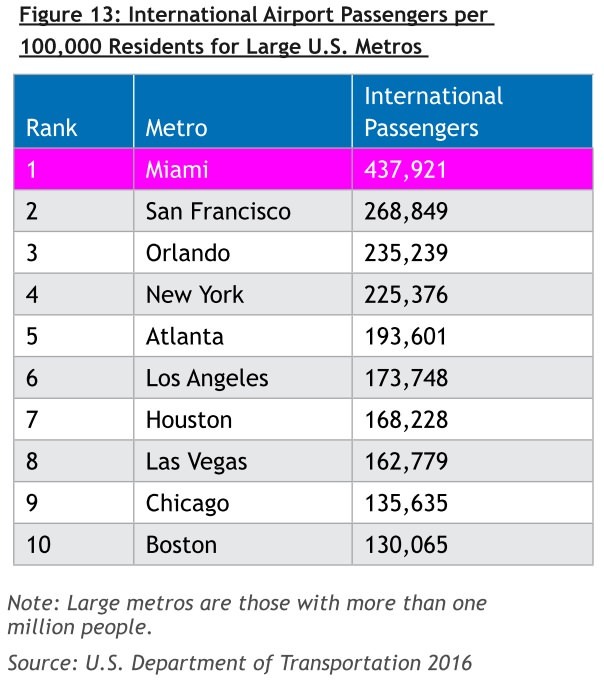 Miami ranks by far at the top of any metro for international passengers passing through the airport per capita. When not adjusted for population size, only New York ranks ahead of Miami. Global cities also have extensive metro lines. and are tearing down highways, not building more. For starters, the Embarcardero Highway in San Francisco and the Big Dig in Boston. See also Alaska Way in Seattle, Rochester, Milwaukee, Portland, and the amazing Rio Madrid project. You can also read about proposals for I-345 in Dallas. For those who say “other great cities are tearing down their highways while Miami is building them up.” What’s the alternative to traffic congestion in the particular area where the highway expansion is being proposed? Public transportation is one thing, but are you people thinking a tunnel is the alternative? Seattle isn’t a good comparison..they are tearing down a highway partly because of the potential for earth quake damage. Building a tunnel in Seattle makes sense. Miami can’t build a tunnel because of flooding. Tunnels aren’t a viable solution in Miami the way they are in Seattle or Boston or other cities. So true. Miami could be the city of the next century if we would just commit to expanding our industry and improving our quality of life (i.e., public transportation). People in New York and Chicago get to the equivalent of Coral Gables or Sweetwater in 20-30 mins each way from the Downtown. Here that same commute is in a car (more dangerous too) and minimum 45-70 minutes each way!!! If only Frankie Suarez and the city/county commissioners felt the same way. There is no solution. In a city where parking is part of the MANDATORY building code, there could be no solution. People take public transportation when it’s difficult to park. Simple as that. That’s why we need more parking garages. I’m more likely to grow hair on the palm of my hand before we have extensive metro lines in South Florida. Due to lack of public transportation not happening. And that has Trump FUMING! Their mostly legal so no he isn’t fuming. If they’re not “white europeans,” he’s fuming. Boy it really doesn’t take long for the racially biased, ethnocentric xenophobes to pop their ugly heads up on this site, even if it’s supposed to be about architecture, design and projects that will help our community prosper. Morons. Why can’t you guys resist temptation and leave the ugliness out? Because they are mentally challenged.. Ignore them. Ha! You Trump lovers hate the Truth. I remember just recently, if somebody could said “I saw a roach crawling across the floor,” I guarantee you some rightwinger would bring up Obama’s name. Now, if somebody mentions Trump’s name, we see these same rightwing crybabies start whining. lmao most hispanics are white europeans, you all love hiding behind this “hispanic and latino terms when you could cry victim. Most hispanics are white Europeans? Really? You wish! I love how (white) American’s conveniently count Hispanics as white or brown based on whether or not they agree with their own political affiliation. I said a true statement and losers still downvoted it, pretty pathetic that your blind hatred for Trump has you all denying reality. We’re in for a long wait if he shuts the government down. I think he should shut it down until Mexico sends the check to pay for it. I can’t help but scream at this lunacy. Do we have to talk about this idiot?! You’re right, this is a terrible distraction. Yeah, I shed a coupla tears over it. Bad ole puddy tats……. So if this is all a good thing, why is our economy based on hospitality jobs and shark lawyers? Where’s… IDK, tech and manufacturing? Well, I’ll give you one example. Do you know that oil drilling off the shore of Florida is a sort after industry? But a lot of residents in this state say NO! So whatever industry you think might be a boon in Florida, remember, it’s going to be under some very rigid scrutiny, especially from nimbys. You know, people can give this comment all the thumbs down votes they want but do some research and you’ll see that’s it true. I wish Miami had a proper tech/manufacturing industry. Places with tech startups, like San Francisco and Shenzhen, started with hardware manufacturing then worked their way into software. So many people in Miami just want to jump to the part where they make a $1B viral app and no one wants to do the hard work to develop a hardware ecosystem or supply base. I think if Miami is to become a global city, it needs to build a manufacturing supply base in Latin America, similar to how Silicon Valley has brought up suppliers in Asia. After that, the tech jobs will spread like wildfire throughout South Florida. Why not here, as opposed to Latin America? Just an honest question.? Miami is much more politically and economically stable than most of Latin America. Plus Latinos love Miami. Awesome! Miami is becoming a global city. Just don’t know how the quality of life will be in the next 5 years, but i do know for sure there will be more rent increase and traffic congestion and more tolls on every exit of a highway. Those jobs are mostly low paying service jobs. Orlando has a long way to go compared to Miami. Took 1 hour from downtown to Hard rock ? stadium to go to soccer match today …. on express lane for $10 !! !